Sphygmology is a 2000-year-old method that is still used in some traditional medicine systems, mainly Iranian, Chinese and Ayurveda. Ibn Sina is one of the most popular physicians in the history of Sphygmology, who had made great contributions to this method, but few meticulous studies have been made on his concepts. In this article, his standpoints on Pulsology are studied. Ibn Sina has mentioned 10 parameters for pulse palpation, and 13 compound pulses, as well. Besides, some pulse patterns applicable for differentiating similar diseases have been introduced. Nowadays some concepts on pulse patterns, such as pulse change in sleep and pregnancy have been studied; but unfortunately many of the ideas on Pulsology have not yet been examined. Sphygmology, as an accessible and inexpensive means, having a substantial diagnosis yield, has been accepted by the people since its rise, and its development over centuries ago. Although some new instruments have been innovated, which can measure different parameters of pulse, yet sphygmology can be one of the most commonly usable diagnostic methods in future, not only applicable by cardiologists but also by all the physicians. Ibn Sina (called Avicenna in Europe) was one of the most outstanding scholars dealing with Pulsology. Therefore; this manuscript was prepared to bring Ibn Sina's concepts into view, in respect with his findings in the field of Sphygmology. For the proper way to examine the pulse, four fingers (having a better sensation along the artery), should be applied, excepting the thumb in that it has a strong pulse itself. Pulse (as a regular beat that can be felt as heart pumps blood around the body) is easily examined by touching the patient's wrist, regarding the fact that the patient may feel uncomfortable when exposing her chest to the physician for measurement of her heart's pulsation. There are other factors influencing the accuracy of pulse examination, among which is the increased pulse width and height, achievable when the patient's forearm is near and vertical to the body. Pulse examination results can also be affected by emotional or physical strain of the healthy persons. Both empty and full stomach can interfere with the accuracy of the examination. Furthermore, results of pulse examination of a patient under imbalanced temperament should be checked with the results derived when the patient is in a healthy situation. According to Ibn Sina's reports, 10 parameters (called Ajnas-e-nabz) are applied for detecting the pulse namely size (meghdaar), fastness or slowness (sorat, ebtaa), strength or weakness (ghovvat, za'af), shortness or length of pulse intervals (tavaator, tafaavot), softness or hardness (emtelaa, khala'a), similarity or dissimilarity (estevaa, ekhtelaaf), regularity or irregularity in diverse pulses (nezaam, gheir-e-nezaam) and harmony related to musical nature of the pulse (vazn). 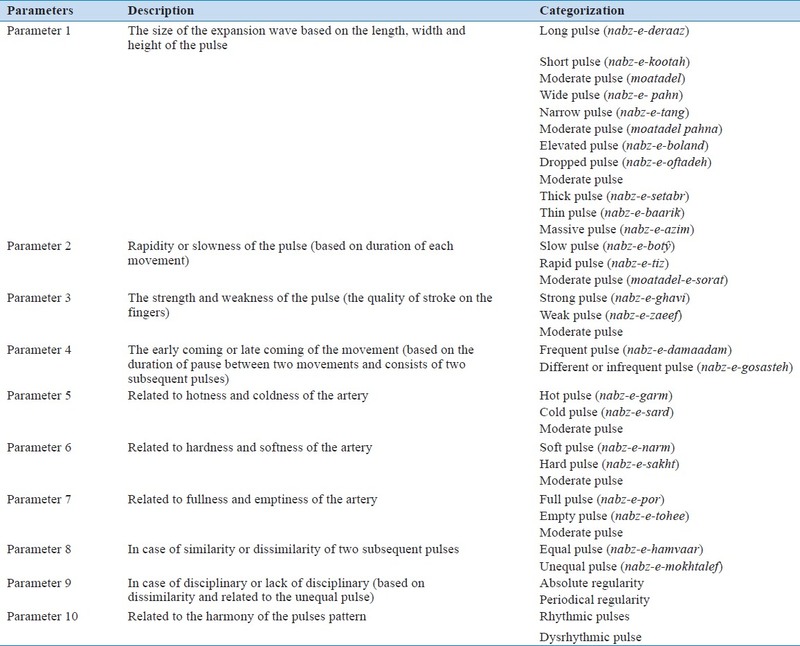 The description of these parameters is represented in [Table 1]. Remarkably the combination of two or more of these parameters results in compound pulses (nabz-e-morakkab). Thirteen different kinds of compound pulses, such as massive pulse, deer pulse, wavy pulse, vermicular pulse and serrate or saw-like pulse have been mentioned by Ibn Sina. Most of the people in the world accept that Pulsology has roots in their cultures. This method is still used by traditional medical practitioners in India, China, and Iran, persistent over 2000 years since its emergence. Such a long persistence could be a valuable proof, confirming the desirable efficiency of this method. It is an inexpensive, fast, painless, precise, convenient and non-invasive method, including important information, and reflecting body health state. In ancient medical systems, various parameters for pulse sensation were being used, where today modern medicine pays little attention to such parameters. As a whole, Pulsology or Sphygmology is highly desirable as a tool, with sense and simplicity, inexpensive, and accessible leading to substantial diagnostic yield. Knowledge of past scientists and scholars, namely Ibn Sina is still of great help towards medical diagnosis. Henceforth, as a recommendation, it is worth to rehabilitate the traditional knowledge on Pulsology of Ayurveda, Persian, Greek and Chinese medical systems, in such a way to be rendered applicable not only by traditional medical practitioners, but by all the other physicians as well. The success of such rehabilitation, will in near future, be a great contribution to cardiologists as well as to all other physicians in different fields of medicine. 1. Hajar Albinali HA. 4,500-year voyage: From pulse tension to hypertension. Heart Views 2005;6:124-33. 2. van Tellingen C. De pulsibus-or sense and simplicity in daily medical practice. Int J Cardiol 2010;142:201-6. 3. Bedford DE. The ancient art of feeling the pulse. Br Heart J 1951;13:423-37. 4. Wang H, Zhang P. A model for automatic identification of human pulse signals. J Zhejiang Univ Sci 2008;9:1382-9. 5. Nejat S, Stolt C. The Importance of the pulse as presented in Al-Qanun f′it Tibb by Ibn Sina (Avicenna): A review. Türkiye klinikleri J Med Ethics Law Hist 2003;11:221-5. 6. Hajar R. The pulse in antiquity. Heart Views 1999;1:89-94. 7. Zhen Y. On the differences and similarities of pulse-taking between TCM and Tibetan medicine. Zhonghua Yi Shi Za Zhi 2000;30:237-9. 8. Chaturvedi GN, Singh KP. Impact of Ibn Sina on pulse examination and materia medica of medieval period of Ayurveda. Indian J Hist Sci 1986;21:358-62. 9. Lad V. Secrets of the pulse: The ancient art of Ayurvedic pulse diagnosis. Delhi: Motilal Banarasidas; 2005. 10. Grzybowski A, Sak J, Pawlikowski J. 500 th anniversary of the birth of the precursor of modern cardiology: Josephus Struthius Polonus (1510-1568). Cardiol J 2011;18:581-6. 11. Celik T. Time to remember Avicenna for his contribution to pulsology. Int J Cardiol 2010;144:446. 12. Zargaran A, Mehdizadeh A, Zarshenas MM, Mohagheghzadeh A. Avicenna (980-1037 AD). J Neurol 2012;259:389-90. 13. Hashemi SM, Raza M. The traditional diagnosis and treatment of respiratory diseases: A description from Avicenna′s Canon of Medicine. Ther Adv Respir Dis 2009;3:319-28. 14. Shoja MM, Tubbs RS, Loukas M, Khalili M, Alakbarli F, Cohen-Gadol AA. Vasovagal syncope in the Canon of Avicenna: The first mention of carotid artery hypersensitivity. Int J Cardiol 2009;134:297-301. 15. Turgut O, Yalta K, Tandogan I. Islamic legacy of cardiology: Inspirations from the holy sources. Int J Cardiol 2010;145:496. 16. Faridi P, Zarshenas MM. Ibn Sina′s book on drugs for cardiovascular diseases. Int J Cardiol 2010;145:223. 17. Zareshenas MM, Faridi P, Abolhassanzadeh Z, Mohagheghzadeh A. Ibn Sina′s treatise on pulsology. Int J Cardiol 2011;146:243-4. 18. Ibn Sina. Rag Shenasi ya Resaleh dar Nabz (Pulsology, or, treatise on pulse). Tehran: Selsele Intisharat-e Anjomane Asare Melli; 1951. 19. Ibn Sina. Qanoun fi al-Tibb (Canon of medicine). Vol. 3. Translated by Sharafkandi A. Tehran: Soroush (Publisher); 1987. 20. Avicenna Al Qanun Fil Tibb (Canon of medicine). Vol. 3. English translation by Hameed HA. New Delhi: Jamia Hamdard Printing; 1998. 21. Ibn Sina. Qanoun fi al-Tibb. (Canon of medicine). Vol. 4. Translated by Sharafkandi A. Tehran: Soroush; 1987. 22. Avicenna. Al Qanun Fil Tibb (Canon of medicine). Vol. 4. English translation by Hameed HA. New Delhi: Jamia Hamdard Printing; 1998. 23. Shoja MM, Tubbs RS. The disorder of love in the Canon of Avicenna (A.D. 980-1037). Am J Psychiatry 2007;164:228-9. 24. Ibn Sina: Urjûzah fî al-tibb. National Library of Medicine [Monograph on the Internet]. Available from: http://www.nlm.nih.gov/hmd/arabic/poetry_2.html . [Last cited on 2012 Aug 4]. 25. Smith SA, Morris JM, Gallery ED. Methods of assessment of the arterial pulse wave in normal human pregnancy. Am J Obstet Gynecol 2004;190:472-6. 26. Rossi P, Andriesse GI, Oey PL, Wienekea GH, Roelofsb JM, Akkermansb LM. Stomach distension increases efferent muscle sympathetic nerve activity and blood pressure in healthy humans. J Neurol Sci 1998;161:148-55. 27. Rabbia F, Calvo C, Leotta G, Grosso T, Morello F, Del Colle S, et al. Pulse rate in childhood: Reference limits. Nutr Metab Cardiovasc Dis 2003;13:287-90. 28. Portela A, Northrup G, Halberg F, Cornélissen G, Wendt H, Melby JC, et al. Changes in human blood pressure with season, age and solar cycles: A 26-year record. Int J Biometeorol 1996;39:176-81. 29. Goldstein HS, Edelberg R, Meiler CF, Davis L. Relationship of resting blood pressure and heart rate to experienced anger and expressed anger. Psychosom Med 1988;50:321-9. 30. Libby P, Bonow RO, Mann DL, Libby P. Braunwald′s heart diseases. 8 th ed. Philadelphia: Saunders Elsevier; 2008.